The "Classic" route which takes riders on an 89 mile tour around the Cols of Berwickshire and the "Nouveau" route which will be the North half of the Tour de Lauder, a shorter 50 mile option but just as challenging. 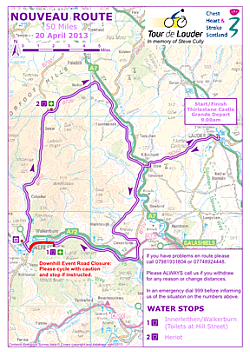 All riders will start at the same time from Thirlestane Castle but the routes will split at Innerleithen. The "Classic" will head South to Traquair and the "Nouveau" will head North to Heriot, both routes' final climb will be the Col de Stow and finish back at Thirlestane Castle. See the links on the right to download PDFs from last year's event. We are in the process of updating them and will upload the new versions as soon as possible. 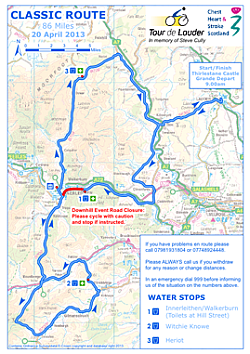 The routes will however be exactly the same the only changes will be dates and placement of refreshment stops. Distance: 50.45 mls. Total Ascent: 3535 ft.